Precision Bearings ABEC 3 - Wever Co., Ltd. The ABEC scale is a system of rating the manufacturing tolerance of precision bearings. The system was developed by the Annular Bearing Engineering Council (ABEC), a division of the American Bearing Manufacturers' Association ABMA). The ABMA was formerly known as the Anti-Friction Bearing Manufacturers' Association. Bearings rated under the ABEC systems are typically called "precision bearings", with a rating or class from 1 to 9. ABEC 1 meets a looser tolerance and ABEC 9 meets high precision tight bearing tolerances. 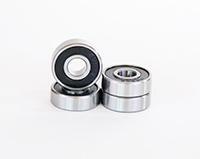 Our precision ABEC 3 bearings are designed and manufactured according to the highest quality requirement for extreme land sports such as skateboarding, roller skating and performance scooters.